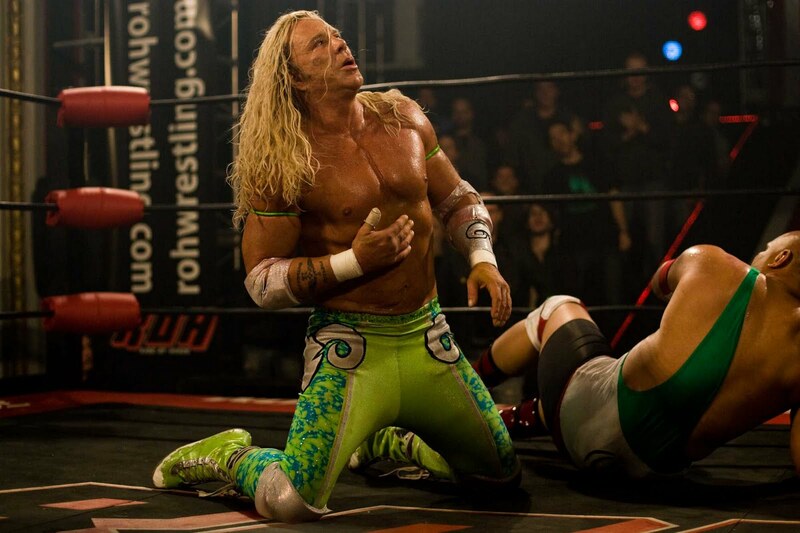 If you haven't seen "The Wrestler" yet and plan to watch it, stop reading now. This post will surely ruin the end for you. Okay, if you're still reading, thanks. The movie played this afternoon on FX. I didn't know it was on today and caught the last hour or so of it. I originally saw it in the movie theater back in 2009. Like most fans, I found it to be a great film. Even my wife, who hates wrestling by the way, enjoyed it. I'm not going to go into details of the movie, if you've seen it, you know what it's all about. I'm writing this more for a discussion piece. Do you think the Ram dies at the end? He's struggling in the ring after having heart surgery. Climbs the top rope and soars in the air. Then it fades to black and the credits roll. Does he become another sad statistic of the business? Or does he triumph with a win over the younger star and relaunch his career. My guess is that the Ram dies in the end. I'm basing this mostly on the fact that there's never been a sequel to the film. I know that's a ridiculous form of logic, but it works for me. Plus, I think the whole point of the film is to show us fans what these guys go through in their lives. It's not always a happy ending. These guys (and gals) sacrifice their bodies, their families, and their morals in some cases for the entertainment of us. In the end, that takes a major toll on their bodies. Some die in the process. We mourn, we chant their names for a while after they're gone, but then we move on. After all, life goes on right? As I write this I'm realizing perhaps instead of being critical of some performers, I should be more appreciative of what they do. But most of my criticism with the business is directed toward the creative staff, writers, and promoters, not the men and women giving their all in the ring. What do you think? Did the Ram die? Am I being too cynical? Weigh in here. Don't forget to follow us on Twitter (@my123cents), like us on Facebook, and subscribe on YouTube. I choose not to believe he died. Being in the business myself, you want to believe that you are invincible but your body tells you otherwise. It was a great movie though. Most of the deaths though don't occur in ring, let alone while performing. Not saying it hasn't but more often than not it occurs in hotel rooms or home. But the movie did let you know that there's a lot that workers go thru than just the in ring stuff. It's important to note that the ending doesn't actually fade to black. It abruptly cuts to a black screen with instant silence. Since I imagine death to be experienced the same way, I'm strongly convinced that The Ram's life ended right then and there. His deteriorating health foreshadows all of this.